Today, I made some. I then ate approximately 4 of them, in rapid succession, and then felt approximately ill. But really, what was I supposed to do? My mother and her friends were sitting around our kitchen table, planning my cousin Laura’s wedding shower and gabbing away about save the dates and “party flow” and napkin schemes. I love a good party, and I love Laura, but when it comes to bridal shower crockery, apparently I’m at a loss. Party flow. napkin schemes. What else could I do but shove warm cream scones down my gullet? They’re not hard to eat, these scones. They’re fragile and flaky, and studded with tiny berries, bright and beautiful, like jewels in the sand. They smell of toasted butter and, though light and crumbling, feel satisfyingly heavy in your palm. That cream. And with a smear of soft butter and jam? You can forget all about napkin schemes. Which is just fine by me. Cream scones are traditionally made with dried currants, I believe. 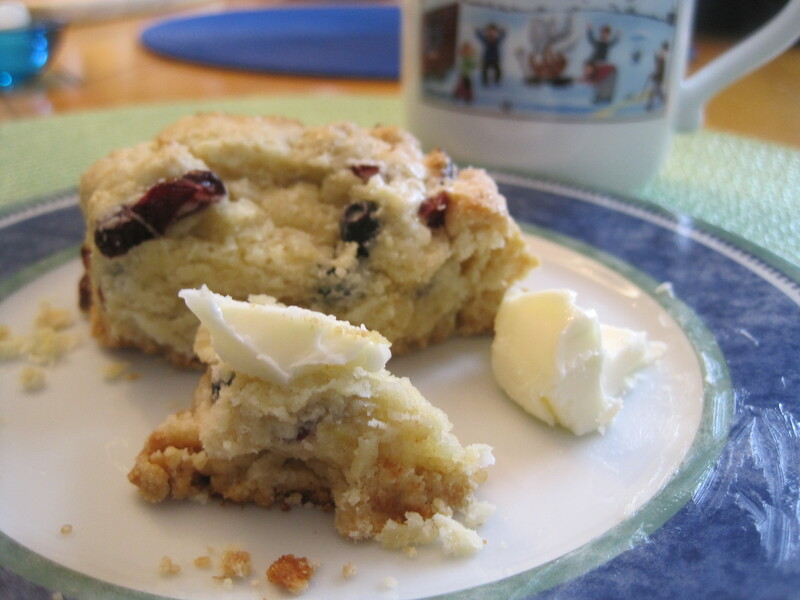 I found a blend of dried berries at Trader Joe’s called “Golden Berry Blend” with golden raisins, cherries, cranberries and blueberries, and found the resulting berry scones to be mildly awesome. In the bowl of a stand mixer (if you don’t have a stand mixer just use a medium-sized bowl), mix together the flours, baking powder, baking soda, salt, and sugar. Add the dried berries and lemon zest, and mix to thoroughly combine. Add the cold, cubed butter, and used the paddle attachment (or a pastry cutter or just two knives) to incorporate the butter into the flour mixture, until the butter pieces look about the size of lentils (or a bit larger). Combine the cream, egg, and vanilla in a small measuring cup or mixing bowl. Pour the liquid into the flour butter mixture, and mix gently, until just combined. The dough will be shaggy and a bit crumbly – this is good. 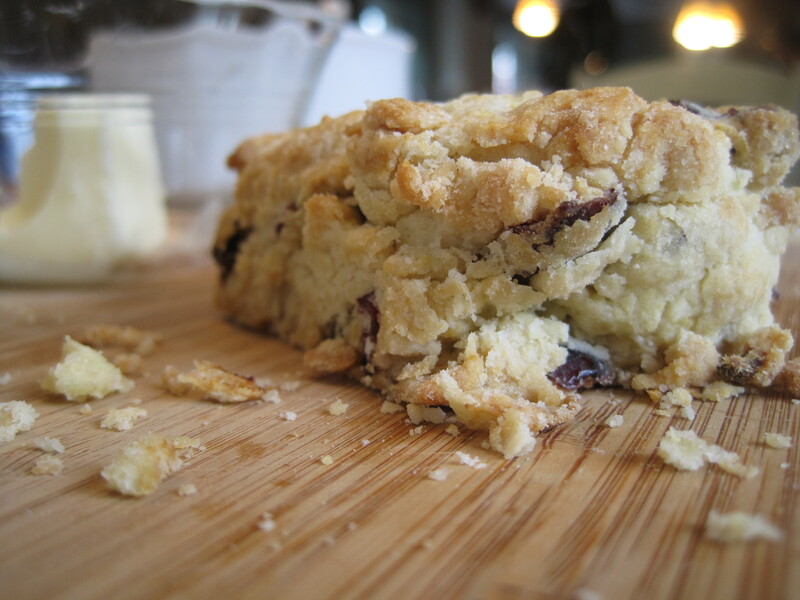 If you over-mix the dough, your scones will come out dense and tough, instead of light and flaky. Transfer the dough onto a lightly floured counter top, and form it into a square about 3/4-inch thick. Use a sharp knife to cut the dough into squares (I got nine), and gently place the squares onto a parchment-lined baking sheet. NOTE: At this point, the scones can be put in the freezer, uncovered and right on their baking sheet, if you don’t want to bake them immediately. I froze mine overnight and baked them off the next morning, from frozen. They work beautifully and this step saves you from having to wake up early to impress brunch guests. Before baking, brush the scones with cream and sprinkle them with sugar. Bake at 400 degrees for about 12 – 16 minutes, or until golden brown. 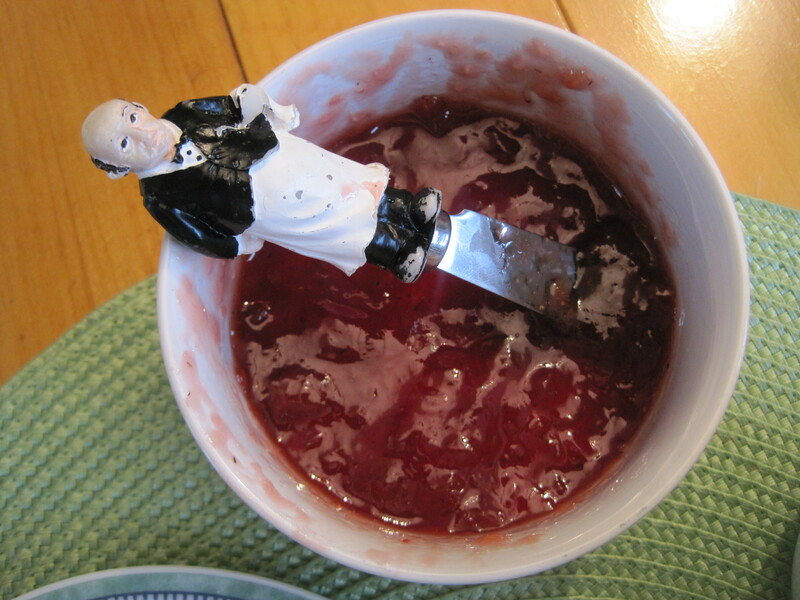 Serve warm, with soft butter and jam. I ate them — BEYOND incredible! I adore chef molly — and her cooking! How lucky am I??? and i love Molly! and her scones! !